Benjamin Gates was born and raised in the Washington Metropolitan Area. He is currently a self-employed Cellist. Benjamin at a very young age had such a love for music that he made homemade instruments and played them making rhythmic sounds. His mom saw his talent and started him in music classes. As a result, Benjamin has been playing the Cello since he was four years old. At the DC Youth Orchestra Program, Benjamin went through the levels very quickly where he ultimately became the Principal Cellist with the DC Youth Orchestra. As Principal Cellist, he played at the White House for the Easter Egg Event in which President Obama and his family was in attendance; he played at the 50th DC Youth Orchestra Reunion; and the Celebration and Honor of Mr. McClain, both held at the Concert Hall, Kennedy Center. As the Principal Cellist for the DC Youth Orchestra Program, Benjamin played with International Youth Orchestra of Americas when they were in Washington, DC and he played at the Organization of Americas for distinguished guests. As a member of the DC Youth Orchestra Quartet, the Junior Virtuosi and the Virtuosi String Quartet, he has played for distinguished guests for the National Endowment of the Arts; the Washington Ballet's Nutcracker Suite at the Willard Hotel, several venues around the Washington, DC area to include the Kennedy Center; the Atlas Theater of Performing Arts; the Zoo; the Tivoli; the Lincoln Theater; the Convention Center at Galas and other special events to name some. He had master classes with Maestro Prieto and Maestro Gerangas. Benjamin’s story was featured in the DC Youth Orchestra literature for fundraising. Additionally, his picture for one year was the face of the DC Youth Orchestra’s website. Benjamin auditioned, was selected attended Duke Ellington School of the Arts where he was the Principal Cellist. He was the solo cellist for the production The Wiz that got raves reviews and it was featured in the Washington Post. Benjamin auditioned and was selected to be in the Capital City Symphony Orchestra. He attended Hampton University as the Principal Cellist. Benjamin played at the Hampton University Graduation where President Obama was the guest speaker. He has played at several venues in the Hampton, Virginia area to include the Hampton Coliseum. Benjamin returned to the Washington, DC area to continue his musical career. 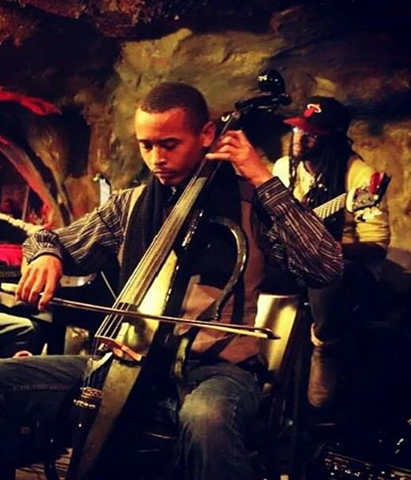 Currently, Benjamin plays the cello at various venues around the Washington metropolitan area to include Chinatown, Georgetown, Eastern Market, and Dupont Circle. He is a cellist with the Sanctified Symphony Orchestra; and the Cellist in the musical, the Cortical Titanic. Additionally, Benjamin was one of the musicians featured in a July 2012 Washington Post article: the District at Dark. Benjamin was a solo cellist performer for the Swedish Embassy’s Mentor One Foundation and played at the International Gala with the Queen of Sweden in attendance in 2012. He played all of his original songs on Washington’s radio station, 89.3, Live at Five.